The Guerilla’s have been to Gibson Place. This type of Guerilla is very rare but has been flourishing for a number of years. It’s good news; they began as two but have multiplied. It’s the gardening guerillas! This type of guerilla has been recognised by Mr.ISOS, who was very pleased and decided to conserve the species with a monetary award. Are these guerilla’s recognised by the Transition Tynedale even though they are a wild untamed species? ‹ PreviousHow Incredible Edible Todmorden happened! Where is Gibson Close ? Can we have a picture? , I would love to see it ! Maybe the Edible Hexham idea has started with no input from Transition – great !! They said ‘Why don’t they do something?’ so we said ‘Shall we do it ourselves?’ they said ‘What’s the point with all those young gurilla’s running around trampling everything’. So we asked the little ones ‘Would you like to garden with us? This is your garden too!’ we said and they agreed. The grown-ups wanted wanted pretty flowers, they said ‘Mr Tesco says ‘every little helps’ so we’re loyal to him and don’t want a scruffy vegetable patch thank you very much. 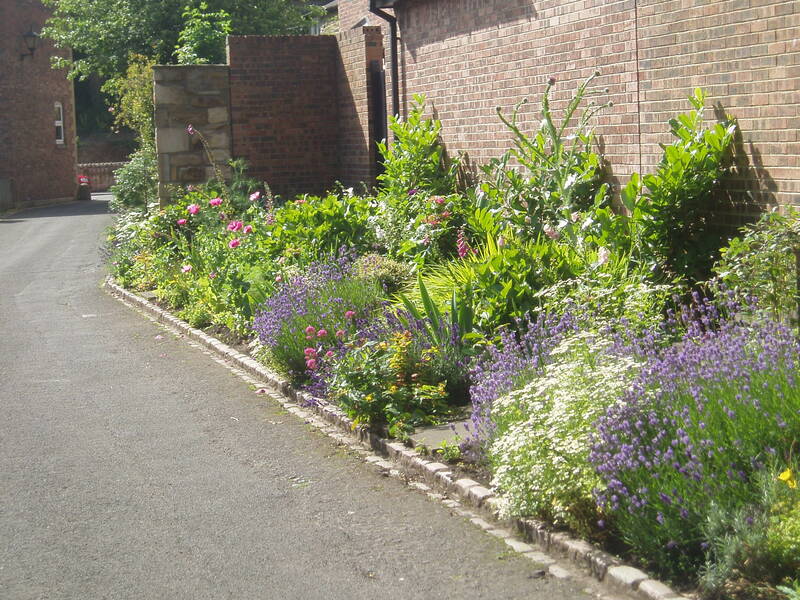 ‘Okay’ we said so every time gardening friends had some flowering plants to give away we put them in the border weeding and tidying as we went and also the little guerilla’s have their own hideout in the back of the border. The nieghbours love the little guerilla’s running around and playing. The lead guerilla (Doris 85yrs) entered our border in Mr. ISOS competition and won a ‘Special Merit’ and garden vouchers 2012. This year one of the little guerillas (Alex 10yrs) grew a campion runner bean plant brought home from school and the very youngest guerilla (Sarah 5yrs) showed Mr ISOS, and his friends how she knows when and how to collect and sow seeds. She has seen her efforts produce results and everbody smiled and said, ‘Ah isn’t that sweet’. The Transition gardeners smiled too and sat in the sunshine with the nieghbours drinking tea and enjoying the warmth of a friendly nieghbourhood and watching the birds the bees and the butterflies at home in the border. 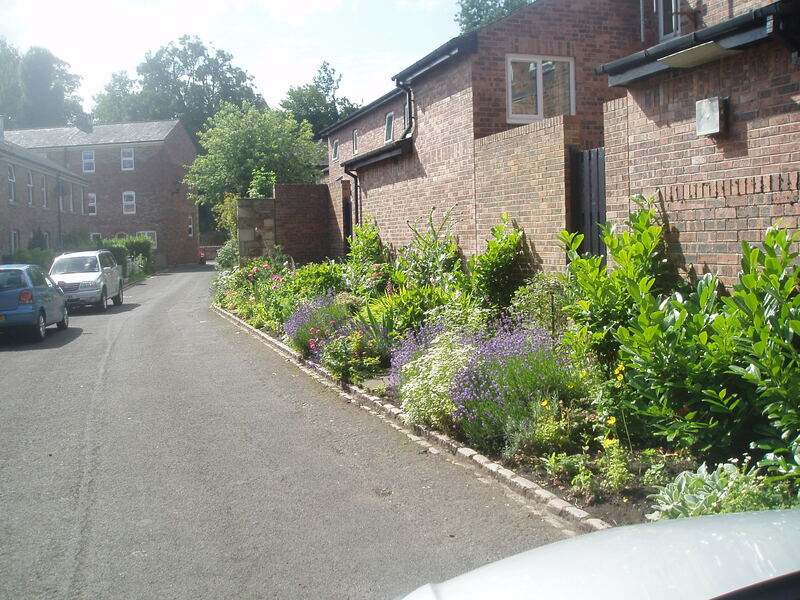 Some fruit bushes, and shrubby herbs are proposed for next year.